With the S&P 500 (^GSPC) near its all-time high, all eyes will be on corporate financial results and guidance. Corporate conditions have been less than stellar in recent months, and analysts have responded by revising lower their expectations for earnings growth. And still, the stock market also booked its best beginning to the year since 1998. Has the trend of rising input costs continued? Will margin compression hurt future business investment? Have multinationals seen any sequential improvements? How is consumer spending/credit demand holding up? How much did the government shutdown impact the quarter? How hard is it to fill open positions? Where is incremental investment going? Did business improve at end of quarter vs. beginning? What are early Q2 trends? Balance sheet deployment going forward? Buybacks, M&A etc. 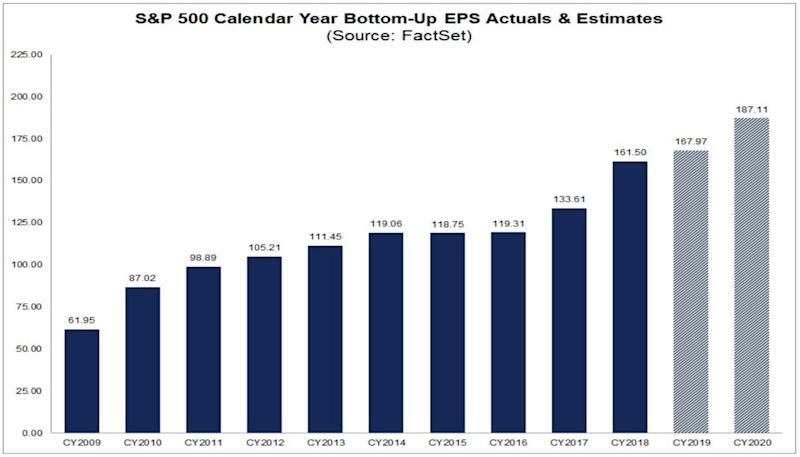 According to FactSet, analysts estimate S&P 500 earnings in Q1 to have declined by 4.3% from the prior year. 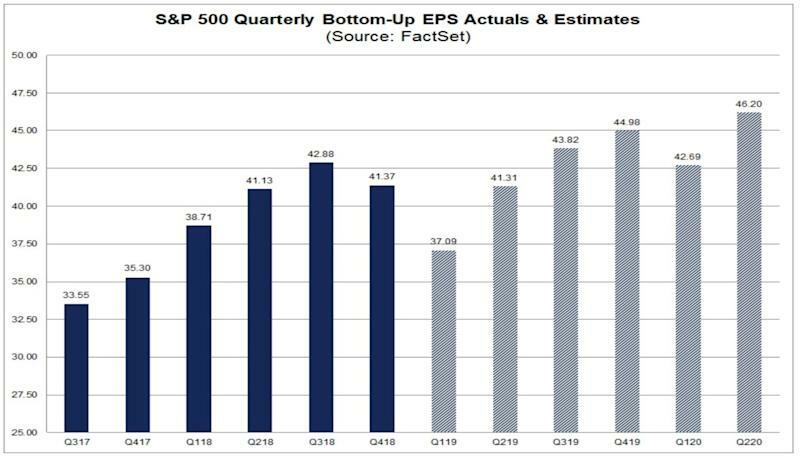 “If -4.3% is the final decline for the quarter, it will mark the first time the index has reported a year-over-year decline in earnings since Q2 2016 (-3.2%) and the largest year-over-year decline in earnings since Q1 2016 (-6.9%),” FactSet’s John Butters observed. Despite the negative first quarter, analysts expect full year earnings to be higher in 2019 than a 2020. Earnings season has just begun with U.S. megabanks JPMorgan Chase (JPM) and Wells Fargo (WFC) announcing Q1 financial results that beat expectations. In the coming week, we’ll hear from Citigroup (C), Goldman Sachs (GS), Bank of America (BAC), Johnson & Johnson (JNJ), UnitedHealth (UNH), IBM (IBM), Netflix (NFLX), United Continental (UAL) and American Express (AXP).